No, Maurice, Godfrey is not saying that Tacitus wrote in the ninth century in Germany. Yes, that is the date of our earliest manuscript of Tacitus but not even Godfrey says Tacitus wrote in the ninth century. The Gospels that we have are not primary but secondary evidence — their physical existence can be traced no further back than the second and third and fourth centuries. Tell me, Maurice, what was the context? What was Godfrey explaining? Why did he mention primary and secondary evidence at this point? Did you actually read the post that led into this discussion? Was Godfrey really saying he believed the Gospels cannot be dated before their surviving manuscripts? You don’t know, do you. Well, I’ll tell you. No, he doesn’t believe the Gospels can be dated no earlier than their surviving manuscripts. Anyone who has read anything he has ever written about the Gospels will know that. You only have to read any of his posts on them and you will see that he always treats them as being dated between 70 CE and the turn of the century. Do you understand, Maurice? You look confused. Yes, why you only have to look at his latest series of posts on his discussion of Clarke Owens’ book subjecting the Gospels to literary-historical criticism. His whole premise is that the Gospel of Mark was written with the fall of Jerusalem and destruction of the Temple in 70 CE fresh in mind. Yes, he does sometimes wonder if we should date the Gospels closer to the Bar Kochba War but he always suggests that as speculation and never builds an argument on it. Godfrey has always based his arguments on the belief that the Gospel of Mark was written soon after 70 CE and always accepted that the other Gospels soon followed. He has only ever speculated that the Gospels might be second century but never based an argument on that speculation. How could you possibly have told such an outright falsehood? Steph told you? Well Steph surely knows better. She had many, many discussions with Godfrey over more than a year and she certainly knows he has never dated the gospels so late. But let’s move on. Do you understand what this is all about yet, Maurice? The significance of the fact that the Gospels are secondary evidence, that physically they don’t go back to the very time and place historians might be studying, is that they need to be assessed more carefully and with more questions before we can know when they might have been originally written and how they should be interpreted as evidence for the events they narrate. Ludicrously late dates for the Gospels are central to the assumptions of mythicists that they are not, and did not incorporate, primary sources. Now do you see what is wrong with that? Give me three things wrong with that statement. Right, Godfrey has never argued for a “ludicrously late date” for the Gospels. Another thing? That’s right, Godfrey does not argue that there was no historical Jesus. You can’t think of a third one? It’s here — you say a late date means Gospels can’t contain primary sources. You were using “primary sources” differently from the way Godfrey was using the term, weren’t you. Can’t you see you are only confusing the reader by using the same word for two different things? Understand, Maurice, it might very well be true that the Gospels were written on the basis of eyewitness reports but we need to test that claim. They are secondary sources and we need to test whether we can rely upon them, to what extent, what their original sources were, and so forth. You see now why you should always do your own fact-checking? I don’t believe you went through Godfrey’s posts to see what he argued. I think you were fed snippets of conversations that upset Stephenie Fisher and you swallowed them along with her comments hook, line and sinker. Now look at what you concluded on the basis of lazily swallowing whatever nonsense and falsehoods Stephanie told you. You have indicated that Godfrey’s central argument is a ludicrously late date for the Gospels. That is the exact opposite of Godfrey’s argument. It is a falsehood, Maurice. A misrepresentation. Do you think you have behaved in accordance with the school’s code of ethics? No. Do you see now why you need to scrap this essay and start all over again? Date is only one consideration when evaluating the nature and value of a document, and alone the date is not decisive on questions of historical value. A late document can sometimes contain more true historical information about a past event than an earlier document. An early or late date for the gospels does not, of itself, make any difference to the arguments for or against the historicity of Jesus. That’s not a nonsense, Maurice. A late document can theoretically contain a lot more reliable information in it than an earlier document if the earlier document is filled with, say, lots of satire or propaganda. Notice Godfrey said that the date “of itself” does not make the difference between authenticity and fabrication. How do you say “of itself” in Aramaic? Imagine an emperor setting up a commemorative monument to boast of his exploits. A later historian might learn that the whole account was propaganda and mostly fiction. (Though that historian would probably need primary source material himself to prove that.) In that case our later historian might be able to leave us a more accurate account of events (a secondary source) than the primary source. That’s what Godfrey was trying to explain, Maurice. So you see that Godfrey was not arguing that the gospels should be dated ludicrously late, and that even if he did argue for a late date, he did not believe that that by itself would necessarily mean they were not reliable as history. No, Maurice, it’s no good pouting and being sullen about this. You’ve broken the school’s code of ethics and need to make amends. I think I’m going to have to separate you from Stephanie in class from now on. No, Maurice, you’ll stop carrying on like a spoiled brat and accept some responsibility for your own behaviour and take the consequences. We have time for one more before I have to leave this afternoon. E. H. Carr. Oh my great golly grandmother’s gallbladder! You don’t believe in keeping your political views out of your school essays, do you. And what on earth is the point of all this rambling on about select biographical details and political controversies and who he shacked up with and who he married for two — two — whole pages! You wrote the same sort of rambling nonsense with von Ranke. Do you know what the name is for someone who likes to show off their learning by introducing an avalanche of utterly irrelevant boring detail, Maurice? We call that sort of person a pedant. You are a pedant, Maurice. A pedant. How do you say pedant in Aramaic? Well, at least you did you homework assignment so now you can tell me why nothing you wrote in those two pages has anything whatsoever to do with the point of Godfrey’s argument, can’t you. Let’s hear it. Tell me. How and why did Godfrey make use of Carr in any of his discussions on historical methodology. Yes, that’s one reason. Carr precipitated a major debate among historians with his book What Is History? Even undergraduates in the late 60s were often required to delve into his arguments in their Honours work. But what was the point Godfrey was taking from his work? That’s right. He was using his explanation of ‘facts’ as the raw material historian work with, wasn’t he. What is an example of a “fact” that Carr talks about? Very good Maurice, you have been doing your homework, haven’t you. Yes, there was a newspaper report of a gingerbread seller being beaten to death in a riot at Stalybridge Wakes in 1850. But did you notice Godfrey goes back a step further than Carr’s own argument about what happens to that information once it gets into history books. How do we know that it was a fact that that poor man was beaten to death? Yes, it was reported in a newspaper. Do we believe everything we read in the newspapers, Maurice? Correct, so why do we believe this happened? No, no, no. You can’t just say “Because we have no reason to doubt.” There has to be a positive reason. Maybe the story was a false rumour that a reporter wrongly believed to be true. There is a stark difference between almost certain facts based on verifiable records (the raw material of historians) and possible events derived from the application of subjective criteria to theological narratives (the raw material of theologians). Even memory theory relies ultimately upon criteriology. Look, for your homework tonight I want you to take this work on how society knows things. It’s a bit old but still as relevant as ever, and I’m sure there are plenty of other more recent works covering exactly the same thing. I will also give you something online before you leave. This is one of those works that explains how social institutions and public trust work. It explains why society tends to have basic trust in information from public schools and newspapers and government institutions and how that trust is qualified and when it can be broken and so forth. In other words, it explains why we can assign a high degree of probability for stories presented in a certain style coming from a certain trusted institution (e.g. dedicated news sources) and different ways the public can always test that information if it is indeed reliable. Now can you understand what Godfrey’s point was about the different raw materials historical Jesus scholars work with and what ancient historians use? Again you look flummoxed, Maurice. Listen. Ancient historians have a few relatively certain facts that they can work with. Coins, inscriptions, archaeological remains. They have primary evidence for the existence of the Roman empire and many of its famous figures like the emperors. That primary evidence confirms certain accounts in some of the secondary evidence, like some of the works of ancient historians, letter-writers, poets and playwrights and so forth. There are some details in those secondary works that have no verification in the primary sources. For example, Cicero mentions his slave Tyro in his letters; Seneca talks about a rival philosopher he hated, Publius Vinicius. But if those sources have proved to be reliable where we can test them, then we have reasonable grounds for trusting them where we can’t. And we always take into account the genre and provenance of a source. Who wrote it? Why? Was it written to entertain? To malign? To educate? Sometimes a secondary source might be verified if it can be tested against another secondary source that can be shown to be significantly trustworthy when compared with primary evidence. they are recorded in the contexts of genres that indicate they are to be understood as real. That’s a very brief summary. Godfrey has written about this often and at length. You and Stephanie and McGrath, too, have no excuses for not understanding the point he is making. Now what facts do Historical Jesus scholars have to work with? The baptism of Jesus? The cleansing of the temple? His exorcisms? His healings? His apocalyptic prophecies? His teachings? But how do you know those are real historical facts, Maurice? What independent sources do you have to confirm them? Yes, I know some scholars argue that there are half a dozen independent sources within the gospels, but that’s a hypothesis. It’s not an established fact that can be universally accepted. 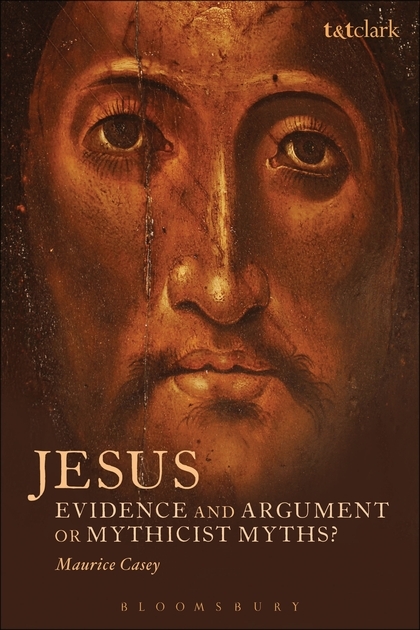 You know very well that every single one of those supposed facts about Jesus is contested in the scholarly literature. A few scholars even contest his crucifixion. Do they pass the criterion of embarrassment test? Do they pass the coherence test? Do they pass the double dissimilarity test? Do they pass the multiple independent attestation test? Do the serve the purposes of literary plot and fulfilled prophecy? And why do you think it is that there is scholarly debate about whether those event really happened? Right. It’s because scholars apply different criteria or give more importance to one criterion over another. So some say the baptism was an embarrassment that would never have been recorded if it were not true; others argue that if it were an embarrassment it would not have been recorded and that the story began without any touch of embarrassment. And the criteria contradict one another. So one historian says that it was an embarrassment to write about Jesus having family who rejected him, and therefore that is true; another will say that Jesus having a family who rejected him was a fulfillment of the prophecy or the antitype of the godly man, so it is possibly a fiction. How do we settle questions like that, Maurice? Right. We can’t. They are all subjective evaluations. And yes, that’s why some scholars are now delving into memory theory to try to establish what “facts” there might have been in Jesus’ life. But even those scholars ultimately come back to the same questions of criteria. And none of this proves mythicism! It is simply applying the normal way historians generally work with source documents to the study of Christian origins. It leaves the question of the historicity of Jesus unanswered and unanswerable. Theologians won’t like that, but historians can only ask questions of documents that the nature of the documents allows them to ask. Historical questions must necessarily be framed by the nature of the materials at hand. What’s that Maurice? You don’t understand how any of this stuff Godfrey really said proves mythicism? Oh by George, you’re starting to get it! That’s exactly right, Maurice. So you’ve probably wasted every line you dedicated to Godfrey, Widowfield and Carr in your book. They may be critical of historical Jesus studies but they have never said that there was no historical Jesus. For Godfrey, at least, the question of historicity never arises. He’s looking for the most economical explanation for Christianity that coheres with the available evidence and is consistent with normative methods of historical inquiry. Here’s some more reading for tonight. I want you to refresh your memory of those discussions that demonstrate the logical inconsistencies of the various criteria and why they are ultimately invalid as tools for objectively establishing the historicity of certain events. The Historical Jesus and the Demise of History, 1: What Has History To Do With The Facts? Posted on 2014-03-06 09:58:29 GMT+0000 by Neil Godfrey. This entry was posted in Uncategorized and tagged Casey: Jesus, Maurice Casey. Bookmark the permalink. I’d like to hear what details Casey gives on this pro and con? Then, I’d like to hear the truth. It’s almost universally held, and the evidence supports that widely held view, that the Gospels are not primary sources for events that occurred in the 20s and 30s. They are primary sources as representations of Christian literature that emerged in the late 1st/early 2nd centuries. That would make them secondary sources for events in the 20s or 30s, or they purport to be. Being secondary sources does not preclude the incorporation of primary sources. Secondary sources are built on primary sources (unless they are just made up, then they are fiction). This all seems like very sloppy work by Casey. Here’s what bothers me about these attempts to refute mythicism: both Casey and Ehrman have dealt with, as Carrier says, the “low hanging fruit.” A strong case would deliberately take on the very best of mythicist arguments and not mix in and muddy the clarity of an argument with chaff. I see skeptics dealing with the strongest evidence for historicity (such as Gal 1:19), but defenders of historicity want to argue against Archaya S or blog comments (sometimes not even the blogposts themselves). I must admit that I don’t like this style of writing (the teacher talking to “student Casey”). Just quoting Casey and refuting him in your normal style is much easier to follow (and would be shorter!). I can’t take Casey seriously. I went through all of this nonsense with him and his surrogate Stephanie Fisher back in 2010 or thereabouts. It will give me a deadly headache if I try to take it seriously all over again. This is the man, who on page 119 of Jesus of Nazareth says that Mark 11:15-17 has no signs of Aramaic, and then reconstructs an Aramaic version of it! How can you take seriously somebody who says something shows no signs of being translated from Aramaic, ‘translates’ it back into Aramaic, and then claims his reconstructed Aramaic shows the original Greek is ‘ a natural part of a straightforward Aramaic narrative’. The man is a disgrace to his profession. But you might consider quoting more of Casey in these posts. I just read the part about the historical method on google-books, so I knew what this talk about von Ranke was about, but it’s not so clear from your post what Casey said exactly.